Following the defeat of the Turks in the Levant,a temporary Occupied Enemy Territory Administration (O.E.T.A.) was established until an allied peace conference could decide on a final outcome. Meanwhile he Allies split it into several administrative sub-units. France administered OETA North consisting of the sanjaks of Beirut, Lebanon, Lataqiya plus several sub-districts. Prince Faisal continued to administer OETA East, much to the disapproval of the French who viewed his temporary appointment as a British attempt to take over the whole of Syria. General Allenby, on behalf of Britain, administered OETA South, consisting of the Ottoman provinces of Jerusalem, Nablus and Acre. Under Ottoman rule, Jerusalem had been governed directly from Constantinople, but Acre and Nablus had both been subdistricts of the vilaiyet of Beirut. 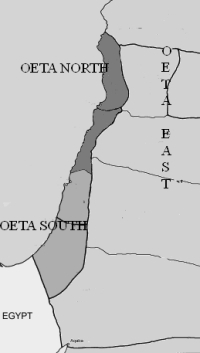 All three provinces of O.E.T.A. South were exhausted by war, and over-run by bandits. Military conscription, starvation and disease had depleted the population. Townspeople were in severe distress; commerce was at a standstill. In rural areas hitherto cultivated land was untilled; stocks of cattle and horses had fallen; woodlands had almost disappeared; orange groves had been ruined by lack of irrigation. However, there was still an efficient Ottoman judicial system with high ranking local officers and modern local police forces. The urban police forces brought criminals to justice through up-to-date detective work and forensics, kept order at religious festivals, and controlled political demonstrations. In addition a paramilitary Gendarmerie was responsible for putting down riots, protecting tax collectors and keeping travelers safe. In rural areas local sheiks administered justice. There was a police station in every district, mostly side by side with detention centres used to house short term prisoners and suspects awaiting trial. The Jewish settlements had their own armed security forces, the Hashomer. 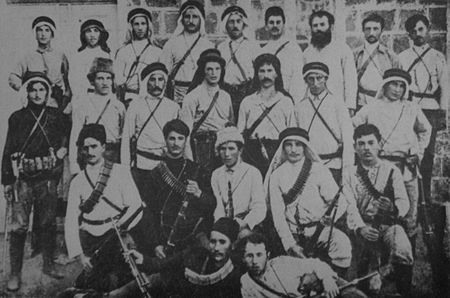 The photo shows a unit of Jewish Hashomer in 1909. General Allenby appointed his military Provost Marshall as head of security and placed both police and local Gendarmerie under his command as well as a Muslim Indian Regiment, that had formed part of the EEF. He also appointed a military officer in each district as commander of the local police. He established a military Administration system that laboured for nearly two years to restore the country's prosperity. It collected revenue authorised by Turkish law and spent it on the country's needs. The government also lent a considerable sum, advanced by the Anglo-Egyptian Bank, in small amounts to the agriculturists, which enabled them to purchase stock and seed, and partly restore their cultivation. Philanthropic agencies in other countries came to the relief of the most needy and provided education. Commerce began to revive, encouraged by the new military railway connection with Egypt and assisted by the military construction of a net-work of good roads. 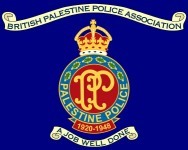 In July 1919 Major-General Sir Harold Watson, now chief administrator of OETA South, anticipating that the ongoing Paris Peace Talks would end with OETA being changed from military to civil administration, appointed the Police Deputy Inspector General of the United Provinces of India, Lt. Col. Percy B. Bramley OBE, to unify all Palestine's urban police forces. Lt Col. Bramley posted the best of the Ottoman police officers to train recruits from Arab villages and newly arrived Jewish immigrants. He also found British and Egyptian Copt officers from Egypt willing to volunteer for the local police. These were sent on a quick training course in Ismailia. Two such were British Reserve officer, Captain James Wesley Mackenzie and a Copt Mounted Policeman, Salim Basta, who had joined the Egyptian Expeditionary Force during WW 1. Their stories will be found as PDFs in the Folder "Individuals". Bramley conducted some research to find a suitable but not too expensive uniform to replace the current police attire that varied from location to location. For headgear, he chose kalpaks that were traditional police headwear in many parts of the middle east, but not worn by most Palestinian Arabs. In the photo Bramley, himself, is shown wearing a police kalpak. The winter uniform became dark blue with white buttons and shoulder titles. Khaki drill tunics over khaki trousers became summer evening uniform but khaki shorts could be worn during the day. Next - Paris Peace Conference.